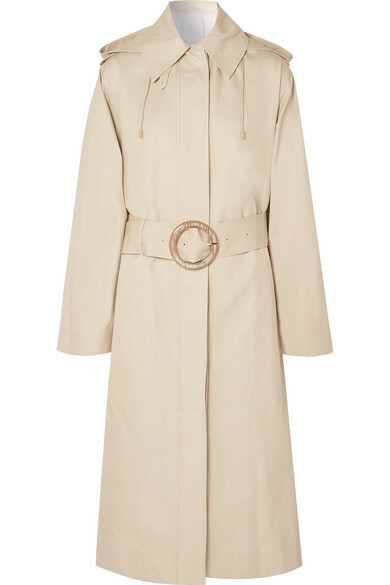 For an outfit that's super easy but can be dressed up or down in plenty of different ways, rock a Joseph carbon hooded cotton garbardine trench coat. To bring out the fun side of you, complement your outfit with black and white canvas low top sneakers. If you're searching for a casual yet incredibly chic ensemble, consider pairing a Joseph carbon hooded cotton garbardine trench coat with black skinny jeans. These two pieces are totally comfy and they will also look amazing when paired together. When it comes to footwear, this outfit is finished off nicely with black leather ankle boots. If you're on the hunt for a casual yet seriously stylish outfit, team a Joseph carbon hooded cotton garbardine trench coat with blue denim shorts. Both of these pieces are totally comfy and they will also look great when worn together. To bring out a sassier side of you, round off your getup with black suede flat sandals. 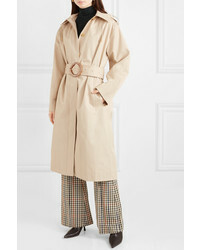 For a smart casual ensemble, try teaming a Joseph carbon hooded cotton garbardine trench coat from NET-A-PORTER.COM with a charcoal sweater dress — these items go really savvy together. Black leather lace-up ankle boots work spectacularly well within this getup. 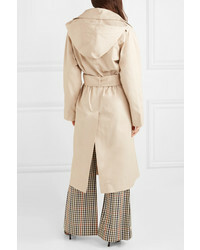 If you're on the hunt for a casual yet stylish ensemble, wear a Joseph carbon hooded cotton garbardine trench coat from NET-A-PORTER.COM and white culottes. As well as very comfy, these two items look great when worn together. For something more on the daring side to complete this ensemble, go for a pair of brown leather lace-up flat boots. If you're searching for a casual yet totaly chic outfit, try teaming a beige trenchcoat with a navy vertical striped shirtdress. As well as super comfortable, these two items look great when worn together. With shoes, rock a pair of beige leather heeled sandals. 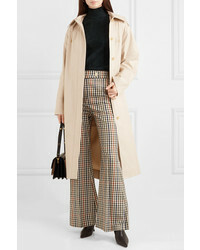 For a casual seriously stylish ensemble, reach for a Joseph carbon hooded cotton garbardine trench coat from NET-A-PORTER.COM and black wide leg pants — these pieces fit really well together. A pair of white leather low top sneakers will be a stylish addition to your outfit. For a casual totaly chic outfit, rock a Joseph carbon hooded cotton garbardine trench coat with black vertical striped dress pants — these pieces play really good together. Make your getup more fun by rounding off with white low top sneakers. For a killer-meets-incredibly stylish ensemble, opt for a beige trenchcoat and navy dress pants — these two pieces play beautifully together. When it comes to shoes, this outfit is round off wonderfully with black suede pumps.